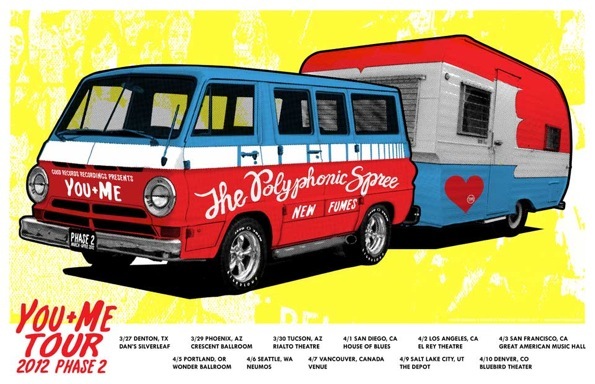 “Phase Two” of The Polyphonic Spree‘s “You + Me Tour” makes its way to San Francisco’s Great American Music Hall on April 3rd. In a recent email interview about the tour, Tim DeLaughter recalled attending his first show ever, a Willie Nelson show in Dallas when he was 8 years old, where he found five dollars on the snack bar floor. When explaining why people should come see the Spree on the “You + Me Tour,” DeLaughter cooly pled, “Please come to our show and I’ll throw $20.00 on the floor in front of the bar for some lucky kid to find.” Long time fans of this Texas-based band will hardly need to be convinced to attend this show. The band’s amazing energy, their upbeat happy-go-lucky vibe, and their eccentric cult like garb is reason enough for us to want to be present for this show. Not to mention New Fumes and Sweet Lee Morrow joining the Spree on the bill for the evening. For your chance to win a FREE pair of tickets to the show, leave us a comment telling us about the very first show you ever attended. Who did you see? Did anything memorable happen? C’mon, give us the details! Contest ends 4/2/12. Check out this amazing (and slightly creepy) fan-created video for “What Would You Do.” The Polyphonic Spree have some of the most creative fans in the biz.